The new Civic Duty .45 ACP has impressive expansion. 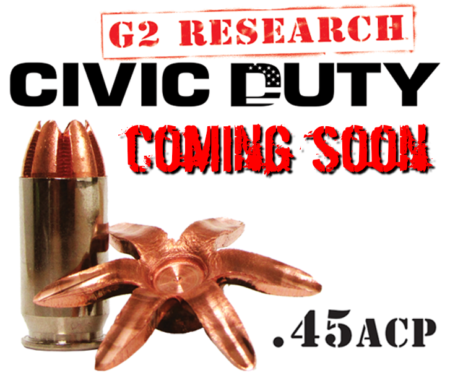 G2 Research has just released their new .45 ACP Civic Duty Ammunition. 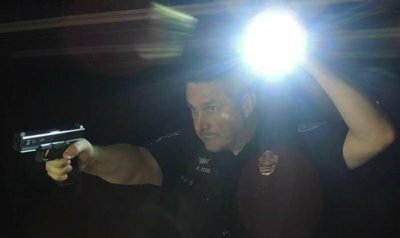 The Civic Duty line is one of four handgun ammunition lines offered by G2 Research, and its potential as a law enforcement or self-defense selection is substantial. The addition of .45 ACP expands the Civic Duty line to cover perhaps the two most popular handgun cartridges, the other being 9mm. G2 Research hails from Winder, Georgia, and has made an impressive entrance to the market with their unique bullet designs. G2 Research has both handgun and rifle ammunition selections. BlueSheepDog first came into contact with G2 Research at SHOT Show, and previously reported on the Civic Duty 9mm ammunition. So far we have been impressed with the potential of the expanding petals on the Civic Duty bullet design, though there is dialogue on whether those petals will actually perform as desired. The most stand-out feature of the G2 Research ammunition is the impressive expansion from their very unique design. The Civic Duty ammunition has much longer and deeper separation grooves along the bullet’s exterior than traditional hollow-point ammunition. When Civic Duty bullets hit soft tissue, the elongated petals expand outward into the shape of a blooming flower. This is accomplished through the aggressive grooves that allow the bullet to expand well over twice its original diameter. In the case of the .45 ACP we’re now talking about a bullet expanding to over an inch in diameter. If there ever was such a thing as “stopping power” this bullet’s design might meet that criteria for the sheer size of the wound created by a bullet expanding to nearly 1.5 inches. The incredible expansion of the Civic Duty ammo is eye-opening. In addition, the rapid and impressive expansion of the Civic Duty bullet provides a much greater potential for the bullet to remain inside the target, thereby transferring all of the bullet’s energy into the target. Typical bonded hollow point bullets can over penetrate, or become clogged with clothing material leading to insufficient expansion, energy transfer, damage and trauma inside the intended target. G2 Research took its innovative Trocar design of the solid copper R.I.P. fragmenting projectile and adapted it to the Civic Duty expanding self-defense round. The G2 Research Civic Duty round is capable of defeating barriers as effectively as the R.I.P. and expands 2.5 times its initial diameter after coming into contact with a fluid medium. The “Extreme Expansion” of the Civic Duty round leads to “100% energy transfer and 99.9% weight retention inside the intended target”, and less concern of over penetration in CQB situations. MSRP – $59.99 for a box of 20-rounds. 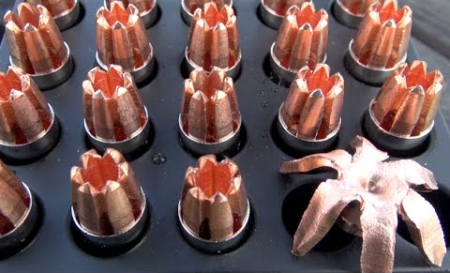 Notice the difference in expansion among traditional hollow point ammo (photo from YouTube). Typical bonded hollow point bullets can over penetrate, leading to insufficient energy transfer, damage and trauma inside the intended target. Some hollow point designs have had problems with clothing or barrier material clogging the hollow point upon impact and preventing full expansion. Other traditional hollow point designs simply do not expand enough to be effective, while others expand well but start to break apart, losing critical bullet mass during travel through the target. G2 Research has taken its innovative Trocar design of the solid copper R.I.P. fragmenting projectile and adapted it to the G2 Research Civic Duty expanding self-defense round. The G2 Research Civic Duty round defeats barriers as effectively as the R.I.P. and expands 2.5 times its initial diameter after coming into contact with a fluid medium. 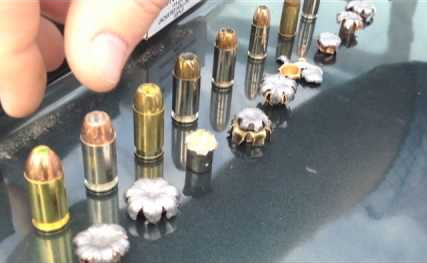 Civic Duty bullets expand to nearly 2.5 times their original diameter (photo from YouTube). There are some websites and ammunition “experts” who believe the Civic Duty ammunition would not perform as advertised, and the petals would dislodge from the bullet mass during travel through soft tissue. This argument is only increased when the naysayers discuss the Civic Duty bullet passing through heavy clothing, drywall, or other intermediate barrier. For someone who is not familiar with metallurgy, bullet design and manufacturing, or standard bullet testing procedures I could see how this belief could be formed. The incredible expansion of the petals could make the uninformed doubt they would stay intact while traveling through mass. It would be easy to believe the petals would expand, but break off quickly and easily, making the remaining bullet mass not much more than a FMJ bullet. However, our friends at TheFirearmBlog have performed an impressive evaluation of the Civic Duty rounds (9mm version), and have all but disproved the naysayers arguments. The authors point out the Civic Duty rounds would not pass the F.B.I. standards for a duty hollow-point round. This is because the F.B.I. requires at least 12-inches of penetration, where the Civic Duty penetrates 10-11 inches. Despite this “failure” the results of TFB testing removes doubt about G2 Research claims about the Civic Duty round, and its performance. The results are very impressive, and when considering the near full mass of the Civic Duty bullet is remaining inside the gelatin one can quickly acknowledge the injury potential such an impact would have on an adversary. Proper ammunition is critical for stopping deadly threats. G2 Research has been on fire ever since they introduced themselves to the greater market at SHOT Show. Their R.I.P. and Civic Duty handgun rounds are very impressive, and should be highly considered by anyone looking for a self-defense round. 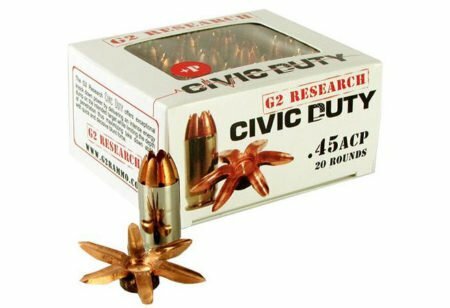 As more and more independent testers prove the Civic Duty lives up to their performance claims, I can only see this round becoming more common in the conversation of the best self-defense rounds on the market. There is no doubt the heavy price tag will be a strong consideration for any shooter. At just over $2 per round for 9mm, and $3 per round for .45 ACP, I just don’t see the G2 Research ammunition making it into the law enforcement armory … yet. Hopefully as the products become more popular, and sales increase, G2 Research will be able to reduce the overall cost while still maintaining necessary profitability goals. To make it even more viable, G2 Research needs to consider a .40 cal. as well. Despite the added cost, we still recommend our readers consider Civic Duty ammunition for their personal defense ammunition selection. When your life, or the lives of your family are on the line, your ammunition cannot fail you. The price of expensive ammunition pales in comparison of the price one would face if their loved ones were injured or killed because a cheaper ammunition failed.